2018 starts with big news for Kyno users - Kyno 1.4 brings the Windows version, LUTs, new codec support and major productivity enhancements and a new-year sale with a 25% discount until the end of January. 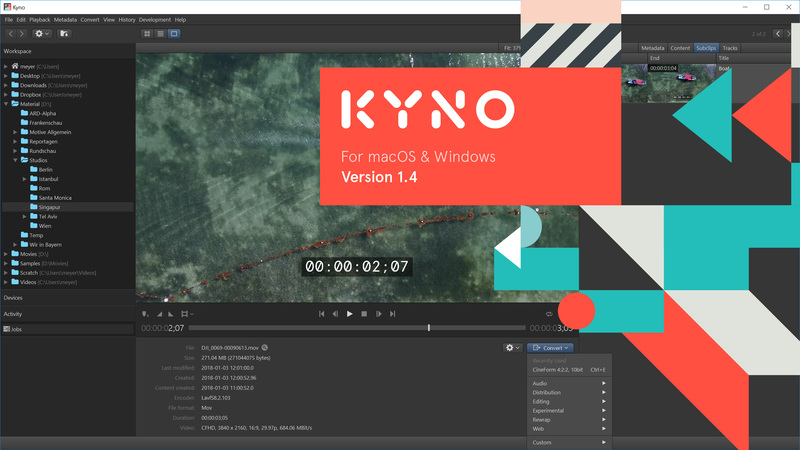 A little more than one year after the first production release of the groundbreaking video productivity app Kyno for Mac, the wait is over for the big Windows community of media professionals. Kyno 1.4 introduces a rock-solid Windows version which has already won over the hearts & minds of many film, tv and social media professionals during its beta phase. We're happy to finally provide the best tool for media management and professional workflow organization as a true cross-platform solution, honouring the fact that the world of professional media is a heterogeneous one, often even within one organization. The importance of lookup tables, aka LUTs has increased considerably with more and more cameras allowing to shoot Log footage and the growing adoption of HDR. Kyno 1.4 now provides seamless integration of LUT handling in material preview, organization and transcoding, offering the fastest and easiest solution of its kind on the market, ideal for QC, postproduction or daily workflows. The new "play all" function further accelerates QC and selection workflows allowing selected clips to be viewed in sequence with just one click or keyboard shortcut (Cmd-P / Ctrl-P). Kyno's popular list view now has configurable columns allowing this user interface to be customized for the task at hand, e.g. focussing on technical or descriptive metadata or a custom combination of both. It is now possible to combine clips using the new feature of the same name, which is just as easy to use as Kyno's much-praised batch transcoding function. It's metadata-aware and adds an array of new options for delivery workflows, e.g. delivering so-called “news cuts” or “assembly cuts” with integrated shot lists, put together within Kyno with just a few simple steps, while still on location, ready for ingest into an NLE or MAM. The much-requested timecode overlay feature (aka burn-in timecode) makes the transcoder an ideal tool for people generating review copies, which is very common in editorial environments. Support for GoPro’s Cineform codec adds another option for 10-bit editing workflows. The player as well as the subclip user interface has seen a number of improvements to strengthen Kyno’s reputation as the best pre-edit footage screening and selection tool on the market. Final Cut X and Final Cut 7/Premiere XML export functions have a new option to deliver xml files with relative paths that make it super-easy to prepare self-contained delivery packages that do not require the receiver to perform reconnect operations within the NLE. Transcoding performance has become even better for many presets when working on very powerful multi-core machines. Last but not least a number of minor improvements and bug fixes have made it into release 1.4. Beginning with release 1.4 users with licenses older than a year will have the possibility to buy a new one-year period of updates for Kyno for the price of 79 $/EUR to benefit from the new release. Remember that this differs from a subscription. Kyno will still continue to function, but users will not be able to run the newest versions after the update period expires. This allows us to keep investing in making Kyno the best tool it can be at a price that pays for itself in time saved very quickly. The 25% discount of our new-year sale will also apply to the update license price. We're so thrilled by this new release that we want to give everyone a chance to give it a try. We've reset all trials so you can sign up for our 30-day trial even if you've done so previously! 2018 will be a great year for Kyno. We're so happy that you will be part of it.